AED.com has created AED Dental Packages to ease the ordering process, and give package discounts to dentists, while helping them to be prepared for a sudden cardiac arrest event in their office. Medical practices are finding that maintaining an AED in their facility where hundreds of people visit each week is now becoming the standard of care. To date, nineteen U.S. states have mandated that dental practices have an automated external defibrillator (AED) in their office. These include: Arkansas, Florida, Illinois, Kansas, Minnesota, Mississippi, New Mexico, North Carolina, Oklahoma, Oregon, Pennsylvania, Tennessee, Texas, Utah, Vermont, Virginia, Washington, and West Virginia. Sudden Cardiac Arrest strikes approximately 350,000 Americans each year, or close to 1,000 victims per day and the vast majority of these happen outside of the hospital. With dentists administering deep sedation, general anesthesia, and seeing an increasing number of elderly patients, the chances of cardiac arrest are more likely in these settings. AED.com has been an AED provider for over 13 years, and has examined buying trends from various industries over the years. "We have seen a great increase in the amount of dental practices purchasing AEDs in both mandated and non-mandated states," commented Justin Darby, Director of Marketing for AED.com. "Medical practices are finding that maintaining an AED in their facility where hundreds of people visit each week is now becoming the standard of care." To provide customers with an easy solution, AED.com has created AED packages at discounted pricing, specifically for dental offices and a variety of other industries. "Ordering an AED online is not always an easy process," remarked Darby. "The customer must choose from an assortment of AEDs with different features, make sure they have all necessary accessories, and of course there's the price." AED.com provides everything needed for a sudden cardiac arrest event in these all-inclusive packages to make the ordering process simple, easy, and at a much lesser cost. 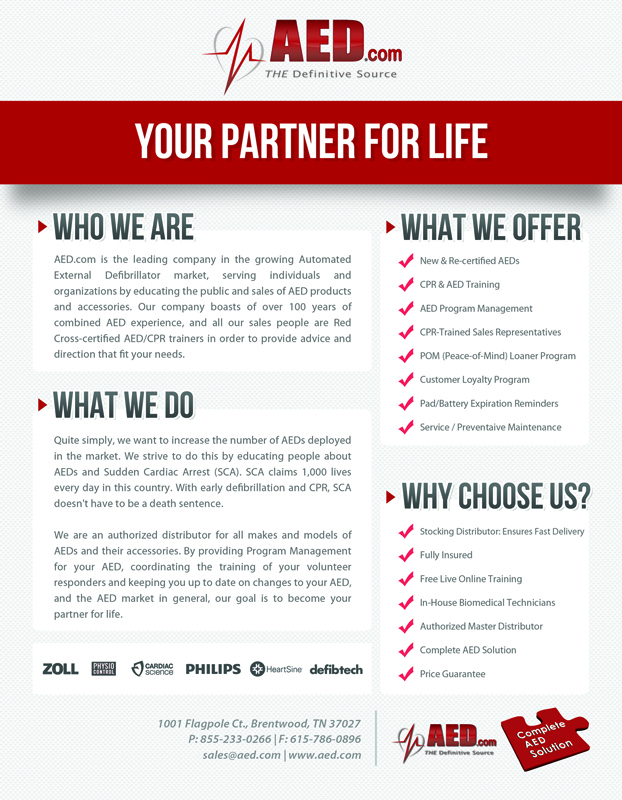 AED.com services over 20,000 customers in all 50 states and 35 countries worldwide. For more information on AED.com's customized AED packages, please visit: http://www.aed.com/aed-packages.